"The SlipTron is a knife you can trust. 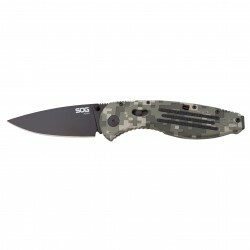 Featuring SOG's patented slip-joint design which locks the blade into an ultra-secure position while open you'll never have to worry about accidental closure again. The entire construction is stainless steel - from handle to blade - so you know you're set when it comes to durability too. As safe as it is sharp the SlipTron is a tool you can carry with confidence.